Among Cut the Crap’s priorities in the upcoming Concordia Student Union general elections, cleaning the bathrooms tops the list, followed by online opt-outs, election reform and charity. While the CSU doesn’t control how facilities management cleans bathrooms, according to their platform available online, they will look to negotiate an improved facilities budget with the Concordia administration, and push for increased hours and pay for janitors. “We would also like to add in some fancy Dyson Airblades if that isn’t too much to ask—and we really don’t think it is,” they wrote in their platform online. The slate declined all interviews with The Link. 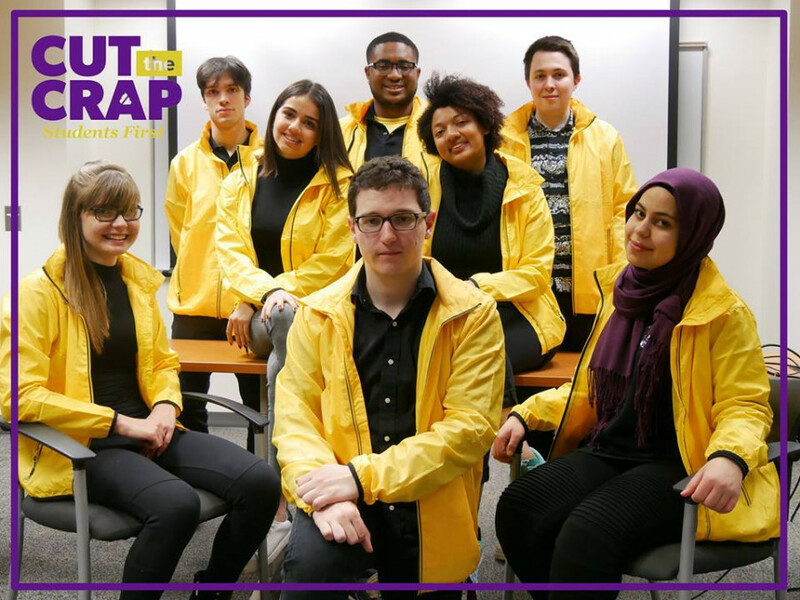 For the union’s November by-elections, Cut the Crap is looking to propose a referendum for online opt-outs—similar to legislation implemented by Doug Ford’s government in Ontario that allows students to opt-out of non-mandatory student fees. Except in this case, Cut the Crap is looking to mandate online opt-outs for fee-levy groups at Concordia. Their platform cited the current opt-out process as “impractical and burdensome” for students. “The current opt-out process is not fun for anyone. The point of a union is to improve the lives of its membership, and online opt-out does that,” their platform says. Currently many students have to arrive in person to get their fees refunded, with not every group attending bi-annual opt-out fairs. Patrick Quinn, running for academic and advocacy coordinator, wants to push for fall reading week. Concordia’s Senate recently began forming a working group on researching the possibility of implementing a fall reading week, with Deputy Provost Anne Whitelaw tasked with forming the committee. CSU’s Student Life coordinator Michele Sandiford told The Link this is misleading since $33,000 was awarded to different projects, it’s just that only $11,000 of their special project budget has been spent so far. Among fee-levy reforms, more microwaves and rebranding the CSU, Cut the Crap will look to implement more mental health services by opening a peer support centre. Their platform states that these support centres are a way for students to talk with peers about their mental health.